Our Kids’ Climate er en internasjonal klimakampanje av grupper av foreldre og andre, der også Besteforeldrenes klimaaksjon deltar. I Paris 28. november 2015, rett før de internasjonale klimaforhandlingene COP21, møttes besteforeldre-organisasjoner fra flere land og ble enige om å danne en egen besteforeldre-allianse. Den har som formål å tale og handle til forsvar av verdens barn og barnebarn og deres medfødte rett til en bærekraftig framtid. Alliansen oppfordrer verdens eldre til å handle mot klimaendringer og for klimarettferdighet. 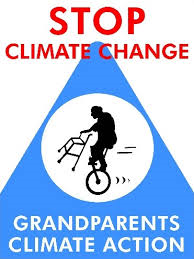 The International Alliance of Grandparents for the Climate (IAGC) speaks and acts in defense of the world’s children and grandchildren, and their inborn right to a sustainable future. We appeal to Elders of all nations to take action on climate change and climate justice. Providing for the safety of all the world’s children and grandchildren, and protecting their right to a sustainable planet is the highest moral duty of humankind. 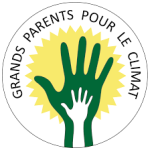 The UN convention on the Rights of the Child states, in Part 1, Article 6 (2) “States Parties shall ensure to the maximum extent possible the survival and development of the child.” We, as concerned elders and grandparents, call upon you, the world’s political leaders to keep this duty foremost in your mind as you meet throughout COP 21. Substantial progress here is absolutely vital in order to solve the climate change and climate justice challenges facing all life on this, our precious Earth. Almost daily the urgency of your task is emphasised by the devastating effects on nature by anthro-pogenic global warming, be they droughts, tornadoes, flooding. The present difficulties of western countries to welcome refugees is the beginning of what we all will be coping with soon. While you work on these critical issues, we elders and grandparents will not stand idly by. We will support courageous climate actions, we will speak and march for intergenerational climate justice, and we will use our long life experience to provide children and youth with opportunities to empower themselves to act for the future of this planet – their future.